demonstrate aspects of our sea rescue activities and hosting visits from groups and individuals who wish to see, at first-hand the way we operate. 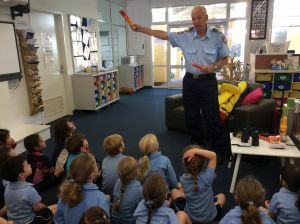 St Hilda’s students fascinated by safety gear. seniors groups, such as University of the 3rd Age, Mens’ Sheds etc. If you would like to enquire about making or receiving a Whitfords Volunteer Sea Rescue visit, please email: promotions@whitfordssearescue.org.au. Please state the name of your organisation, the number of people, (if you wish to visit us) and two or more optional dates. Make sure you give us at least 1 months’ notice.